The last-ever episode of rural sitcom The Vicar of Dibley scored a ratings hit by pulling in 12.3 million viewers. 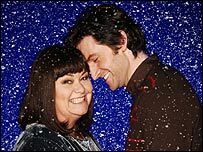 The BBC One show featured Dawn French's Reverend Geraldine Granger getting married to man-of-her-dreams Harry, played by Richard Armitage. The New Year's Day visit to EastEnders was watched by 10.7 million, while two helpings of Coronation Street got 10.5 and 10 million viewers respectively. The Christmas Day episode of the Dibley two-parter was watched by 11.4 million. While the New Year episode was watched by more people than the first part, it had a smaller share of the audience - 44.9% compared to 47%. The highest rating non-sports programme of 2006 was an edition of Coronation Street from March, which attracted 12.5 million viewers. ITV1 drama Dead Clever, shown at the same time as The Vicar of Dibley, attracted 4 million, while the new adaptation of the Wind in the Willows was watched by 5.3 million. Another strong performer was Noel Edmonds' Deal or No Deal, with 4.1 million viewers in its early evening slot on Channel 4.